Alfred Gerada (1895-1968) is best known as the cartoonist associated for many, many years with Progress Press which he joined as press artist at the age of 38. His tens of thousands idiosyncratic cartoons, so immediately identifiable by his style, provide a history of Malta’s political travails. He also designed coats of arms, posters, logos, badges, and advertisement book illustrations (including the original cover of Ġwann Mamo’s Ulied in-Nanna Venut fl’Amerca). Gerada was an autodidact who left school at the age of 14, but he became a fine designer with notable draughtsman qualities, winning several international design competitions in London, Paris, and Ottawa. His art, especially in the watercolours in the present book, has a spontaneous naïveté and a charm of its own, not to mention, in this case, its outstanding importance of a historical and social record of Malta’s most perilous times since the siege of 1565. The background to this very interesting book starts with Albert Ganado buying a collection of over 160 medium-format watercolours from the family after Gerada’s death. This cache had been quite unknown as it was never mentioned by his biographers. Ganado, to use a tired cliché, surely needs no introduction. He owns what is possibly the finest collection of Melitensia in private hands. Unlike some collectors, Ganado does not keep the collection tucked away to gloat but actively studies it and publishes most interesting papers and books. 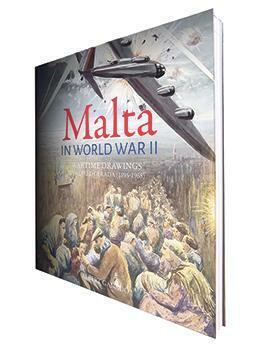 This latest book is a delightful publication which should especially interests all those who follow the part played by Malta in World War II, as well as all those keen on the history of local art as well as Maltese society in a very particular time. A few years back, Ganado had published an accompanying volume mostly concerned with military events. This volume, however, deals more with the civilian aspect which makes it far more interesting for the general reader and is, to all intents purposes, a stand-alone. 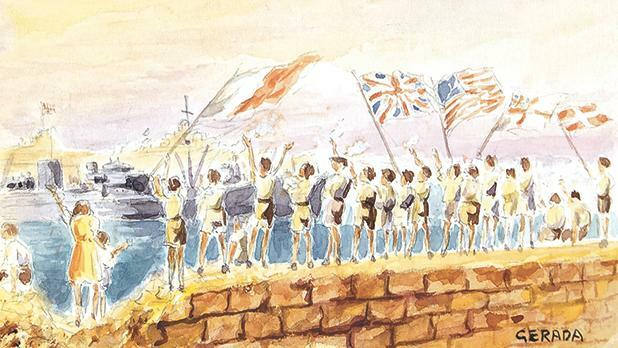 Although there are quite a number of pictures of Malta under siege made by British war artists, these 116 watercolours have the merit of having been done by a local artist over the period of the siege itself. Some other Maltese artists may have also carried out a few sketches and paintings, but this portfolio is unique for its vastness and complete nature. It is a first-class documentary record. During the war, Gerada was employed by the Progress Press. From his room in Strickland House in St Paul Street (not St Paul’s, please), he must have had a great view of the terrible action taking place all around him, especially on the Grand Harbour. 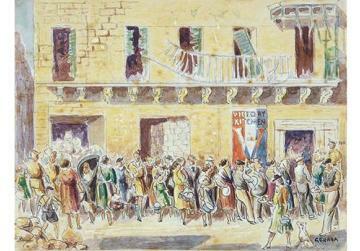 One particular watercolour indeed shows a raid in progress ‘from my studio window’. The author’s commentary on each picture provides a vivid succinct account, and taken it its totality, makes up a potted history of the suffering of the Maltese civil population during the dark war years. Very often, like a Cicerone, he takes the opportunity to add historical data about particular sites culled from his encyclopaedic knowledge of all things Maltese. It was indeed a time of suffering inflicted on the general population with deadly bombs almost daily falling from the sky, sometimes in places least expected, and the pangs of hunger daily pinching one’s stomach. Yet, going by Gerada’s pictures, many a woman seems to have managed to retain their ‘portly’ appearance in spite of the all-encompassing famine. Although the second part of the book, captioned by Denis Darmanin, may not have the immediate appeal of the war scenes depicted, it is nevertheless a most precious record of the various uniforms, field ser­vice caps, formation signs, flashes, pen­nants, types of camouflage, and depictions of people who carried out various activities. For those with a deep interest in the war, they provide a valuable source of information. But most readers will be at­tracted and remain fascinated by the other depictions of actual events which Gerada could have himself witnessed or by those general scenes of everyday life which went on despite the bombing raids. Gerada gives us vivid pictures of the arrival of HMS Welshman and of the Santa Marija convoy, the Talabot ablaze beneath Floriana, the Bofors emplacement at the Upper Barrakka firing away, and so on. What is quite striking is that in all the harbour scenes, the bastions and high points of view are always packed with onlookers. 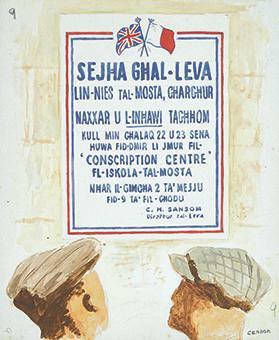 Then there are the heart-rending scenes of destruction like St Paul Street (painted from just outside where Gerada had his Allied Newspapers studio) filled with rubble, the forlorn skeleton of the Valletta primary school, the shattered streets of Senglea, and the devastated Argotti Gardens where, however, lovers still met for their trysts. In all scenes the backdrop consists of heaps of rubble and gutted buildings. The bombing led to a huge evacuation from the harbour area, very effectively shown as columns of people laden with whatever they could carry wend their painful way (similar scenes we have been recently seeing in Isis-threatened lands) and houses marked with crosses to show that they were taking in refugees. Actually one of the most striking pictures is an unfinished one showing goats being led the goatherd in devastated Senglea. The goats have been sketched but not coloured in giving them an eerie but fascinating ghostly aspect. And yet, among all this devastation, the people tried to soldier on as best they could. Salvatore Micallef kept his florist’s shop open at the corner of Pjazza Regina, where it still lies today; musicians still went round in the evening playing the popular tunes; tombola parties were held outside shelters; and even Sunday picnics were held in the devastated Barriera area in the harbour. The ‘Talkies’ still attracted people, with even the hallowed Manoel Theatre ser­ving as a cinema. The Maltese must also become more or less accustomed to that most unMaltese way of doing things: queuing. There are queues for water and kerosene, but apparently when it came to potatoes and bread, it was more of a free-for-all. The longest queue and the most orderly one by far, however, is that of men queuing from the Palace and all around Pjazza Regina to get cigarettes! Judging by the number of pictures depicting brawling women, tension must have often given rise to full-fledged fights. Gerada sometimes cannot resist a humorous comment, like the woman cooking over a kenur fed with whatever pieces of wood she could get hold of and creating an unholy looming black sooty cloud. 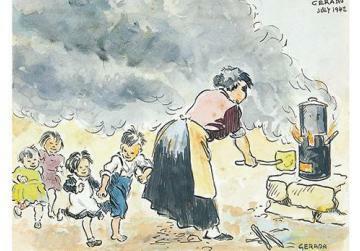 He calls the drawing Il-Patalott – the first smoke screen? On the 50th anniversary of Gerada’s death in 1968, this book is fitting tribute because it shows as aspect of his art that had not been much known. However, it is also a fitting tribute to an island and its doughty people who held on steadfastly in the face of almost daily raids for over three years. For those who actually experienced the siege, whose number is decreasing with every passing year, this book will remain a proud memorial. It should also serve as an eye-opener to all of us who thankfully never had the misfortune to experience such a catastrophic time.